ABSTRACT: Peroxisome proliferator-activated receptors (PPARs) are nuclear transcription factors, and play a central role in insulin sensitivity, lipid metabolism, and inflammation. PPAR -γ appears to improve glycaemic control by increasing peripheral insulin sensitivity and reducing hepatic glucose production, thereby helping to preserve beta-cell function. However, they have modest beneficial effects on lipid parameters. It has been observed that fibrate drugs which activate PPAR- α, produce significant improvements in dyslipidaemia and decrease atherosclerotic lesions, but do not affect glycaemia. Theoretically, a compound targeting both α and γ PPARs simultaneously, might combine the benefits of thiazolidinediones (TZDs) and fibrates. Hence, there is a resurgence of interest in the development of new antidiabetic drugs that combine the insulin-sensitizing effects of PPARγ activation with the additional lipid-modifying activity of the other PPAR subtypes. Compounds that act on both receptors may represent an attractive treatment option, provided that the potential to improve both glycemic and lipid parameters can be achieved within the same therapeutic window in order to minimize the incidence of PPAR-related side effects. The ongoing basic studies have elucidated the cardio protective role of PPAR delta. Therefore, further studies are on the track to develop PPAR α/δ and PPAR γ/δ dual agonists and PPAR α/γ/δ pan agonists for the treatment of diabetic cardiovascular complications. INTRODUCTION: Peroxisome proliferator-activated receptors (PPARs) are nuclear transcription factors, and play a central role in insulin sensitivity, lipid metabolism, and inflammation. They help in the regulation of storage and catabolism of dietary fats and glucose, adipocyte differentiation, inflammatory responses, and cancer. α (alpha) - Expressed in liver, kidney, heart, muscle, adipose tissue, and others. β/ δ (beta/delta) - Expressed in many tissues but markedly in brain, adipose tissue, and skin. γ1 - expressed in virtually all tissues, including heart, muscle, colon, kidney, pancreas, and spleen. γ2 - expressed mainly in adipose tissue. γ3 - expressed in macrophages, large intestine, white adipose tissue 2. The Physiologic Role of Peroxiosme proliferator activated Receptors: The classical biological activity of PPAR α is the regulation of the rate of fatty acid uptake and their esterification into triglyceride or oxidation whereas PPAR γ is classically involved in adipocyte differentiation, regulation of fat storage, and maintenance of glucose homeostasis. The physiological functions of PPAR δ are instead still unclear, although it is known that this receptor contributes to an inflammatory switch through its association and disassociation with transcriptional repressors. In recent years, there has been increasing appreciation of the fact that, in addition to the classical biological activities mentioned above; PPARs have several other pleiotropic functions. For instance, they provide a fundamental contribution to the regulation of certain physiological activities of the prostacyclin (PGI2) system in cardiovascular tissues. Indeed, PGI2, which is the most abundant product of arachidonic acid in vascular tissues, acts through a dual signaling pathway, that includes both G protein– coupled cell surface receptors named IP and PPARs. In this respect, it has been recently demonstrated that the angiogenic abilities of stable analogues of PGI2 depend on their capacity to act on PPARs. Additional evidence also suggests that selective activation of PPAR α and PPAR γ promotes a robust angiogenic process in vitro and in vivo, through a mechanism that depends on the stimulation of the prototypical angiogenic agent vascular endothelial growth factor 1. Potential Therapeutic Indication of Peroxisome- Proliferator activated Receptors: The clinical importance of PPARs originates with fibrates and thiazolidinediones (TZDs), which respectively act on PPAR α and PPAR γ and are used to ameliorate hyperlipidemia and hyperglycemia in subjects with type 2 diabetes mellitus (T2DM). Fibrates, such as gemfibrozil, clofibrate, fenofibrate, and bezofibrate, are drugs that effectively reduce triglycerides (TG) and free fatty acids (FFA) and increase high-density lipoproteins-cholesterol. Fibrates also improve glucose tolerance in T2DM patients, although this activity might be attributable to the fact that some of these compounds also have potential PPAR γ activity. TZDs, such as rosiglitazone, pioglitazone, troglitazone, and ciglitazone, are insulin-sensitizing drugs and have constituted a major advance in the recent therapeutic management of T2DM. In addition to improving insulin sensitivity, TZDs have also effects on TG, FFA, and ketone body level in several animal models of T2DM 3. Thiazolidinediones (TZDs) or glitazones like rosiglitazone and pioglitazone are higher affinity PPAR-γ agonists for type 2 diabetes 4. Thiazolidinediones or TZDs act by binding to PPARs gamma and alpha receptors, a group of receptor molecules inside the cell nucleus, specifically PPAR gamma. The ligands for these receptors are free fatty acids (FFAs) and eicosanoids 5, 8. Glitazones cause an increase in insulin sensitivity and produce hypoglycaemic effects by increasing fatty acid extraction by adipose tissues, shifting the energy metabolism of myocytes towards glucose consumption, up- regulating or activating molecules involved in insulin signaling and glucose uptake, producing a protective effect on pancreatic beta-cells, and inhibiting tumor necrosis factor (TNF)-α 2. The TZDs have also been shown to have antiproliferative, anti-inflammatory, and immunomodulatory effects, with a potential role in the treatment of diabetic complications, inflammatory-proliferative diseases in non-insulin-resistant euglycaemic individuals, autoimmune, atopic and inflammatory diseases, sepsis, and reperfusion injury 5. Patients with diabetes have an increased risk for cardiovascular disease that contributes to a decreased life expectancy 6. Various observational and interventional studies have indicated that some insulin sensitizers appear to reduce the incidence of cardiovascular events, and improve survival 7, 8. TZDs activate peroxisome proliferator-activated receptor gamma (PPAR- γ), a member of the nuclear receptor family of transcription factors, to exert a wide range of plasma glucose lowering strategies, including increased expression of glucose transporters, increased glucose uptake, and reduced hepatic glucose production. Besides lowering plasma glucose levels, TZDs also modulate plasma lipid and lipoprotein profiles 9, 10. Recent studies have found that PPAR- β/δ is also a regulator of serum lipids 11. However, there are currently no drugs in clinical use that selectively activate this receptor. Therefore, modulators that promote both PPAR-alpha and/or PPAR-gamma agonism could theoretically offer significant benefits in improving the dyslipidaemia state, reducing hyperglycaemia and thus hinder the cardiovascular disease risk factors associated with type 2 diabetes mellitus and metabolic syndrome (table 1). In addition, such a therapy could improve the underlying insulin resistance and help break the cycle of altered glucose and lipid metabolism that promotes type 2 diabetes mellitus 12. PPAR-γ Adipocytes, skeletal muscle, and cardiac muscle. Improvements in insulin sensitivity and glycemic control. Adipocyte differentiation and fat deposition. Antihypertensive angiotensin II Type1 receptor antagonists has selective PPAR-γ-modulating activity. Oral hypoglycemics like, pioglitazone and rosiglitazone. Peroxisome proliferator-activated receptor gamma (PPAR γ) agonists are a class of drugs that act as insulin sensitizers, providing glycemic control 13. Agonists of the related alpha-subtype of the peroxisome proliferator activated receptor (PPAR α) improve the lipid profile, lowering levels of TGs and raising levels of HDL-C. An ideal dual PPAR α /γ agonist would provide both glycemic control and an improved lipid profile at a well-tolerated therapeutic dose 14. Different PPARs regulate distinct metabolic pathways (figure 1), and the ultimate goal of the combination agonist strategy is to activate each receptor subtype to provide maximum efficacy on appropriate target genes while keeping adverse side-effects to a minimum. That these adverse effects have diverse origins (eg, cancer, renal dysfunction, and cardiovascular risk) suggests that many of these problems are compound specific rather than a result of the dual activation of PPARs, which lends support to the development of new agents of this class 15. Almost all TZD drugs so far investigated for antidiabetic activity are associated with cardiovascular adverse effects. The reason for the apparent differences between cardiovascular outcomes with the TZD medications has not been fully elucidated. It has been hypothesized that the beneficial effects of pioglitazone on lipid profiles may play a role, and it is known that agonists of PPAR receptors modify the transcription of genes involved in glucose and lipid metabolism. For this reason, efforts to improve the effects of PPAR receptor agonists on lipid parameters have focused on increasing agonism toward the PPAR-α receptor 16. The PPAR-α receptor is the site of action for gemfibrozil, bezafibrate, ciprofibrate, fenofibrate, and some elements of omega-3 fatty acids. In clinical studies, PPAR-α receptor agonists have been shown to increase HDL levels, decrease triglyceride levels and fatty acids, and shift LDL toward less atherogenic particles 17. The positive effects of fibrates (weak PPAR-α receptor agonists) on both HDL-C levels and cardiovascular endpoints have been shown in different clinical studies 18. Novel dual-acting peroxisome proliferator-activated receptor alpha and gamma agonists: Given the favorable effects of fibrates on both lipid parameters and the hypoglycemic effects of PPAR-γ agonists, a dual PPAR-α/γ agonist could be effective in the treatment of patients with diabetes. Termed the glitazars, several dual PPAR-α/γ agonists have been developed, although none have been approved for clinical use due to the results of both preclinical animal studies and clinical studies 19. Agents such as ragaglitazar, MK-0767, and naveglitazar were found to be associated with an increased incidence of both bladder cancer and hyperplasia in rodent studies. Due to these concerns, a phase III study with ragaglitazar was terminated early and further development was not pursued. In addition, the development of tesaglitazar was discontinued because of indications that it may cause renal dysfunction 20. Muraglitazar is the glitazar with the most extensive data and has been shown to be effective in reducing HbA 1c and triglyceride levels while increasing HDL-C levels 21. After completion of phase III studies, it was recommended for FDA approval. Prior to official approval from the FDA, a metaanalysis performed by Nissen and coworkers 22 found that the 2374 patients treated with muraglitazar had an increased risk of death, myocardial infarction, or stroke when compared with patients who received either pioglitazone or placebo. After publication of these data, the sponsor withdrew its application from the FDA and muraglitazar was never approved for clinical use. While the theoretical benefits of dual PPAR agonism are promising, development of agents has been limited due to the adverse effect profile seen in prior studies. Tesaglitazar is a glitazarwith biologically active form of (S)-enantiomer, whereas, the (R)- enantiomer is approximately 100 times less potent than its antipode. In a pharmacokinetics study on eight healthy male subjects after a single oral or intravenous (i.v.) dose of 1 mg of tesaglitazar, the maximum plasma concentration (Cmax) was achieved at a 1 hour post dose with 100% bioavailability. It has a mean plasma clearance of 0.16 litre /hour, the volume of distribution at a steady state of 9.1 liters, and an elimination half life of 45 hours. Tesaglitazar was mainly metabolized before excretion, and about 20% of it was excreted unchanged, resulting in a renal clearance of 0.030 l/h Plasma protein binding of tesaglitazar was high (99.9%), and the mean blood-plasma partitioning ratio was 0.66 ( low affinity for red blood cells). There was no indication of partial inversion of the (S) - enantiomer to the corresponding (R)-form. Tesaglitazar was well tolerated. In a dose-escalation study in healthy males, oral tesaglitazar demonstrated an increase in concentration time curve (AUC) and the Cmax proportionally, with increasing doses, indicating linear pharmacokinetics 23. Food had no effect on the extent of its absorption, although the rate of absorption was reduced in the fed state. In animal studies, tesaglitazar has been shown to lower circulating TG, glucose, and insulin levels in mice models with type 2 diabetes, and has been shown to lower circulating triglyceride and insulin levels in obese zucker rat models of insulin resistance 24. Also, clinical evaluation has shown that tesaglitazar improves lipid and glucose metabolism, increases insulin sensitivity, and improves the atherogenic lipoprotein profile in patients with dyslipidaemia associated with insulin resistance. Both PPAR α and γ are expressed in the kidney, and their agonists exhibit renoprotective effects in type 2 diabetes 25. In various animal studies, treatment of db/db mice with tesaglitazar for 3 months, significantly lowered fasting plasma glucose and the homeostasis model assessment of insulin resistance levels, but had little effect on body weight, adiposity, or cardiac function 26. It was observed that treatment with tesaglitazar was associated with reduced plasma insulin and total TG levels, and increased plasma adiponectin levels. Tesaglitazar markedly attenuated albuminuria and significantly lowered glomerulofibrosis, collagen deposition, and transforming growth factor-beta1 expression in renal tissues of db/db mice. Moreover, in cultured mesangial cells and proximal tubule cells, where both PPARs α and γ were expressed, tesaglitazar treatment abolished high glucose-induced total collagen protein production and type I and IV collagen gene expression. Thus, tesaglitazar is found to have a reno-protective effect in diabetic patients 25. The development of muraglitazar and tesaglitazar was discontinued due to compound-specific side effects that included elevated risk of cardiovascular events for muraglitazar and decreased renal function for tesaglitazar. Moreover, in clinical studies, both muraglitazar and tesaglitazar increased weight gain and edema to a similar or even greater degree than pioglitazone 21, 24. Ragaglitazar (NNC 61-0029 or (-) DRF2725): Ragaglitazar has high affinity for the PPAR-α andγ receptors with IC50 values of 0.98 and 0.092microM, respectively.In pharmacokinetic studies, ragaglitazar showedrapid absorption with tmax: 1.5-1.7 h, t1/2 of 80hours, following a single dose (1-120 mg) and 104hours in healthy subjects, and 122 hours in patientsafter multiple dosing [a loading dose and thereafteronce-daily doses (0.5-16 mg)]. 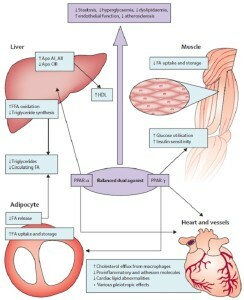 It has beenobserved that 4 mg ragaglitazar daily for 21 daysresulted in decrease in fasting levels of plasmaglucose (18%), C-peptide (18%), fructosamine(6%), TG (36%), FFA (49%), total cholesterol(11%), low-density lipoprotein (LDL), cholesterol(21%), and very low-density lipoprotein (VLDL)cholesterol (15%), as well as an increase in HDLcholesterol (33%) 27. Ragaglitazar was welltolerated; however, peripheral oedema and anaemiawere reported at the highest dose level (16 mg).In a study on early and late diabetes stages inZucker diabetic fatty (ZDF) rats, ragaglitazartreatment resulted in overall reduced circulatinginsulin, and improved insulin sensitivity to a greaterextent than after treatment with rosiglitazone. Inlate-intervention therapy, ragaglitazar was found toreduce Hb A1c by 2.3%, as compared to 1.1%reduction by rosiglitazone 29. It has been observed that ragaglitazar andpioglitazar equally improve metabolic profile andinsulin sensitivity in ZDF rats, particularly whenthey are administered early in the course ofdiabetes. Ragaglitazar improves -cell functionmore than three-fold with preventionand intervention therapies, whereas pioglitazarshowed improvement only in intervention therapy.In a 12-week, double-blind, parallel,randomized, placebo-controlled dose-ranging studyon 177 hypertriglyceridaemic type 2 diabeticsubjects, ragaglitazar, in doses of 1, 4 and 10 mg,resulted in a significant decrease in fasting plasmaglucose, TG, FFA, apolipoprotein B, LDLcholesterol, and total cholesterol, and also resultedin a significant increase in HDL cholesterol. Common adverse events were oedema, weight increase, leukopaenia, and anaemia 30. Farglitazar (GI262570): It is the L-tyrosine analogue, and has high affinity for the human PPARγ nuclear receptor, and a low but possibly important activity for the PPARα receptor (1,000 times less potent on PPARα). It has robust effects on glucose, high-density lipoprotein (HDL), and triglycerides (TG), in diabetic patients. Its blood glucose and lipid lowering activity have been demonstrated in patients of Type 2 diabetes. The blood pressure (BP) lowering effect of farglitazar has also been reported in various studies. A 4- week randomized, double-blind, parallel-group study on 304 hypertensive type-2 diabetics, showed dose-dependent (0.5, 1, 2, 5, or 10 mg daily) reductions in a mean 24-hour ambulatory BP with farglitazar, in comparison to placebo. Farglitazar 10 mg resulted in a statistically and clinically significant lowering of mean diastolic and systolic BP with smaller no significant decreases at lower doses. Farglitazar was well tolerated, with no clinically significant increase in heart rate. Dose-related oedema was seen (up to 13% at 10 mg after 4 weeks) 32. Naveglitazar: Naveglitazar (LY519818); is a nonthiozolidinedione PPAR α / γ dual, α dominant agonist. After oral administration, naveglitazar is well absorbed and moderately metabolized. The most prominent metabolite observed in circulation is the R-enantiomer of naveglitazar, LY591026, which is formed via enzymatic chiral inversion. Para- Hydroxy naveglitazar and the sulfate conjugate of para-hydroxy naveglitazar, are also observed in circulation in most species, especially in the monkey. It is metabolized by enzymatic chiral inversion, aromatic hydroxylation, oxidative dehydrogenation, and/or various phase II conjugation pathways. Naveglitazar is highly bound to plasma proteins among the species examined (>99%) (33). Arylthiazolidinedione (TZD 18), Isoxazolidinedione (JTT-501) and KRP_297 are other duel PPAR α and γ agonists under development 1, 3. Experimental dual agonists’ muraglitazar, ragaglitazar, fariglitazar and tesaglitazar were initially promising, but alarming side effects were observed during development. A meta-analysis of phase II and III clinical trials found that muraglitazar increased the composite risk of nonfatal myocardial infarction, nonfatal stroke, or all-cause mortality in diabetic patients compared with placebo or pioglitazone (N _ 3725; relative risk _ 2.23; 95% CI, 1.07-4.66) 32. Ragaglitazar had significant carcinogenic effects in rodent bladders and is no longer being developed for human use. Tesaglitazar’s development was discontinued because it severely increased serum creatinine in diabetic patients 38. Aleglitazar; is a new dual PPAR-α/γ agonist. Designed to be a balanced agonist of both PPAR-γ and PPAR-α, 13 clinical studies have been completed thus far in over 600 patients evaluating the clinical effects, safety, and pharmacokinetics of aleglitazar. The compound has been found to have peak onset in approximately 3 hours and a half-life between 5 and 16 hours 36. Following a single-blind, 4- to 5-week placebo run-in period to wash out any previous hypoglycemic or weight-lowering drugs, 332 patients were randomized to double-blind treatment with one of four aleglitazar doses (50 μg, 150 μg, 300 μg, or 600 μg once daily), placebo, or open-label pioglitazone. Patients were followed for 16 weeks with the primary endpoint being the efficacy of the drug in reducing HbA1c concentration over the study period. Changes from baseline in fasting plasma glucose levels and lipid profiles were prespecified secondary efficacy endpoints. Given the prior concerns regarding cardiac safety with the glitazars, an independent blinded clinical events committee adjudicated on, according to prospectively defined criteria, the incidence of safety endpoints, including peripheral edema, death (cardiovascular vs non-cardiovascular), heart failure, myocardial infarction, coronary revascularization, and admission to hospital for unstable angina. Changes in bodyweight and renal function, as well as markers of inflammation, were also measured 35, 38. After 16 weeks of therapy, aleglitazar when compared with placebo was found to produce a significant, dose-dependent reduction in HbA1c of −0.85% (95%CI −0.50, −1.20; p < 0.0001) and the concentration of fasting plasma glucose (−2.16 mmol/L, 95% CI −1.35 to −2.98; p < 0.0001). Although the study was not powered to assess the significance of differences between aleglitazar and pioglitazone, the 150 μg dose of aleglitazar when compared with 45 mg of pioglitazone was associated with similar reductions in HbA 1c and fasting glucose levels. Perhaps more important than the hypoglycemic effects, there were dose-dependent, statistically significant beneficial effects on lipid parameters. Aleglitazar, compared with placebo, increased HDL-C levels in a dose-dependent manner by up to 28% and reduced triglyceride levels by as much as 38%. Aleglitazar also significantly reduced LDL-C levels, although by a lesser magnitude than the other lipid fractions. The substantial favorable effects of aleglitazar on HDL-C and triglyceride levels support the hypothesis that this agent might reduce cardiovascular complications among diabetic patients 36. All doses of aleglitazar were well tolerated throughout the study. Adverse event rates in the aleglitazar treatment groups were similar to those of both the placebo and pioglitazone groups. Most adverse events were mild and considered unrelated to treatment; however, at all doses of aleglitazar there were dose-dependent increases in both bodyweight and the number of patients with edema, which were similar to those with pioglitazone. Prior studies of fibrates, tesaglitazar, and phase I studies of aleglitazar have suggested that PPAR-α agonism may result in a decline in creatinine clearance. In SYNCHRONY, aleglitazar reduced creatinine clearance by between 4% and 14%. In patients treated with the 150 μg dose, aleglitazar reduced creatinine clearance by 6% 37, 38. While these results are promising, caution is warranted in overoptimistic interpretation of the data given that the small sample size and short duration of this phase II study prevent definitive conclusions regarding both efficacy and long-term safety of aleglitazar. Large-scale, ongoing phase III studies will provide both stronger evidence and further data on the effects and safety of aleglitazar 35, 37. Based upon these data from the SYNCHRONY study, the 150 μg daily dose of aleglitazar was selected for the ongoing phase III trial because it was thought to offer the optimal combination of glycemic control equal to that of pioglitazone, adverse effects of magnitude equal to or less than with placebo or pioglitazone, and favorable effects on lipid profiles that were numerically greater than with pioglitazone. These findings from SYNCHRONY suggest that aleglitazar may be an effective agent for the treatment of hyperglycemia and the modification of cardiac risk factors in diabetic patients, without the attendant safety concerns observed with previously studied glitazars 36, 37. In light of previous studies that suggested pioglitazone may reduce macrovascular complications, 35 the effect of aleglitazar on lipid profiles observed in SYNCHRONY raise hope that an agent with balanced PPAR-α and -γ agonism may favorably influence cardiovascular endpoints while achieving glycemic control. Towards this end, aleglitazar is currently under evaluation in a large-scale phase III randomized trial (ALECARDIO) to determine whether this agent can reduce cardiovascular mortality and morbidity in patients with type II diabetes and a recent acute coronary syndrome event. A total of 6000 patients with type II diabetes will be randomized within 2–6 weeks of hospitalization for acute coronary syndrome (myocardial infarction or unstable angina) to either 150 μg of aliglitazar or placebo in addition to standard medical therapies for coronary artery disease and diabetes. The trial is event-driven, and will continue until there have been 950 adjudicated endpoints and all patients have been treated for a sufficient duration (minimum 2.5 years) to develop an adequate safety database. The primary endpoint of the study is the time to first occurrence of any component of the composite endpoint of cardiovascular death, myocardial infarction, or stroke. Isohumulones: These are the bitter compounds derived from hops that are present in beer. Hops, the female inflorescences of the hop plant (Humulus lupulus L.), are used as a preservative and flavouring agent in beer. Isohumulones, called iso- α acids, are the compounds that impart the bitter flavour to beer. Previously, humulone was shown to inhibit angiogenesis by suppressing cyclooxygenase-2, and to have antibacterial properties. Recently, among the three major isohumulone homologs, isohumulone and isocohumulone are found to activate PPAR α and γ. In an animal study on diabetic KK-Ay mice, isohumulones (isohumulone and isocohumulone) were found to reduce plasma glucose, TG and FFA (65.3, 62.6, and 73.1%, respectively, for isohumulone), as seen with pioglitazone. However, unlike pioglitazone, isohumulone treatment did not result in significant body weight gain. Moreover, C57BL/6N mice which were fed a high fat diet that were treated with isohumulones, showed improved glucose tolerance, reduced insulin resistance, increased liver fatty acid oxidation, a decrease in size, and an increase in apoptosis of their hypertrophic adipocytes. A double-blind, placebo-controlled pilot study on diabetic patients, have demonstrated a significant decrease in blood glucose and haemoglobin A1c levels after 8 weeks of therapy with isohumulones (by 10.1 and 6.4%, respectively, versus week 0) 34. Hence, isohumulones have the potential to be a therapeutic option in type 2 diabetes and metabolic syndrome. Future Prospects: Aleglitazar’s cardiovascular effects require further investigation. The diversity of these cardiovascular effects, as well as other side effects, underlines the importance of thoroughly evaluating new peroxisome proliferator-activated receptor agonists before and after widespread clinical use. Further research is required to understand why peroxisome proliferator- activated receptor agonists seem to improve cardiovascular risk factors while having only modest or even negative, effects on cardiovascular outcomes 15. A large-scale clinical trial of the effect of aleglitazar on cardiovascular death, myocardial infarction, and stroke is currently ongoing. If successful, this investigation may lead to approval of the first agent specifically targeted to reduce the burden of cardiovascular disease in patients with diabetes. The ongoing basic studies have elucidated the cardio protective, vascular protective and anti-inflammatory roles of PPAR δ (39). Therefore, further studies are on the track to develop PPAR α/ δ and PPAR γ/δ dual agonists and PPAR α/γ/δ pan agonists for the treatment of diabetic cardiovascular complications. More powerful new compounds with pan-PPAR activity and proven long-term safety should be highly effective in a clinical setting of patients, with coexisting relevant lipid and glucose metabolism disorders. These discoveries pave the way for the development of drugs for treating chronic multigenic cardiovascular and metabolic diseases, for which therapy is presently insufficient or nonexistent. 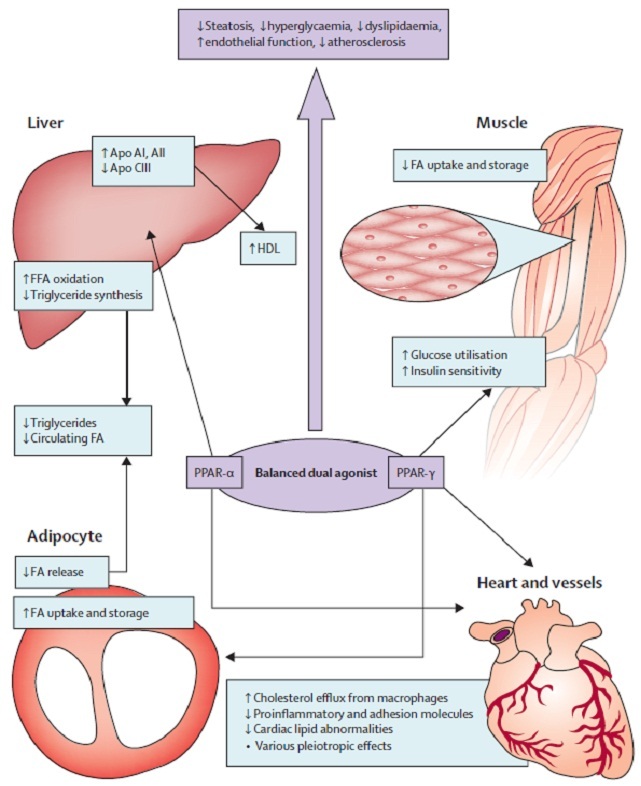 With increasing evidence of the pathophysiological importance of the dyslipidaemia associated with type 2 diabetes mellitus, metabolic syndrome and insulin resistance, a more aggressive approach to lipid management is required through diet, exercise and specific lipid-altering drug therapy, as well as with antidiabetic agents that improve some of the associated complex atherogenic parameters. Nuclear receptors are an attractive and relatively unexploited target for drug development. Functioning as transcription factors and thereby controlling cellular processes at the level of gene expression, modulation of nuclear receptor activity produces selective alterations in downstream gene expression. These characteristics, combined with their involvement in significant diseases, make nuclear receptors a key target for the development of disease-specific therapy. CONCLUSION: Selective PPAR γ agonists, such as thiazolidinediones, elicit improvements in insulin sensitivity and glucose tolerance, but are often associated with weight gain and edema in humans. Selective PPAR α agonists, such as fibrates, are associated with improvements in the lipid profile, but are also associated with increases in serum creatinine, with minimal effect on glycemia. Compounds that act on both receptors may represent an attractive treatment option, provided that the potential to improve both glycemic and lipid parameters can be achieved within the same therapeutic window in order to minimize the incidence of PPAR-related side effects. Barnstable C.J, Tombran-Tink J. Neuroprotective and antiangiogenic actions of PEDF in the eye: molecular targets and therapeutic potential. Prog Retin Eye Res. 2004; 23:561–77. Caring for diabetes>treatment and prevention> emerging therapies. Emerging therapies.www.caring for diabetes.com. Muayed M El, Lavis VR, Safi HJ, Fuentes F. Use of glitazones in cardiac patients: A case for B-type Natriuretic Peptide Monitoring? Am J Cardiol 2004; 93:600-1. Skrumsager BK, Pedersen PC, Nielsen KK, Müller M.Ragaglitazar: no pharmacokinetic differences between young and elderly, male and female subjects, fasted and non-fasted state including impact of hepatic recycling on the plasma elimination half-life www.easd.org/customfiles/easd/38. Sobel BE. Optimizing cardiovascular outcomes in diabetes mellitus. Am J Med. 2007; 120 (9 Suppl 2):S3-11. Mazzone T. Prevention of macrovascular disease in patients with diabetes mellitus: opportunities for intervention. Am J Med. 2007; 120(9 Suppl 2):S26-32. Bodes G. Free fatty acids as target for therapy.Curr Opin Endocrinol Diabetes 2004;11:258-63. Pershadsingh HA. Peroxisome proliferator-activated receptor-γ: therapeutic target for diseases beyond diabetes: quo vadis? Expert Opinion on Investigational Drugs 2004; 13(3):215-28. Michalik, L., B. Desvergne & W. Wahli: Peroxisome proliferatoractivated receptors beta/delta: emerging roles for a previously neglected third family member. Curr. Opin. Lipidol. 2003, 14, 129– 135. Bishop-Bailey, D. & Wray J.: Peroxisome proliferator-activated receptors: a critical review on endogenous pathways for ligand generation. Prostaglandins Other Lipid Mediat. 2003, 71, 1–22. Zingarelli B, Cook JA. Peroxisome proliferators-activated receptor-gamma is a new therapeutic target in sepsis and inflammation. Shock 2005; 23(5):393-9. Dormandy JA, Charbonnel B, Eckland DJ, et al. Secondary prevention of macrovascular events in patients with type 2 diabetes in the PROactive Study (PROspective pioglitAzone Clinical Trial In macroVascular Events): a randomised controlled trial. Lancet 2005; 366 (9493): 1279–89. Krey G, Braissant O, L'Horset F, et al. Fatty acids, eicosanoids, and hypolipidemic agents identified as ligands of peroxisome proliferator-activated receptors by coactivator-dependent receptor ligand assay. Mol Endocrinol 1997; 11 (6): 779–91. Steiner G. Fibrates and coronary risk reduction. Atherosclerosis 2005; 182 (2): 199–207. Frick MH, Elo O, Haapa K, et al. Helsinki Heart Study: primary-prevention trial with gemfibrozil in middle-aged men with dyslipidemia. Safety of treatment, changes in risk factors, and incidence of coronary heart disease. N Engl J Med 1987; 317 (20): 1237–45. Long GG, Reynolds VL, Lopez-Martinez A, et al. Urothelial carcinogenesis in the urinary bladder of rats treated with naveglitazar, a γ-dominant PPAR α/γ agonist: lack of evidence for urolithiasis as an inciting event. Toxicol Pathol 2008; 36: 218–31. Buse JB, Rubin CJ, Frederich R, et al. Muraglitazar, a dual (alpha/gamma) PPAR activator: a randomized, double-blind, placebo-controlled, 24-week monotherapy trial in adult patients with type 2 diabetes. Clin Ther 2005; 27 (8): 1181–95. Nissen SE, Wolski K, Topol EJ. Effect of muraglitazar on death and major adverse cardiovascular events in patients with type 2 diabetes mellitus. JAMA 2005; 294 (20): 2581–6. Sanwald-Ducray P, Liogier D'ardhuy X, Jamois C, et al. Pharmacokinetics, pharmacodynamics, and tolerability of aleglitazar in patients with type 2 diabetes: results from a randomized, placebo-controlled clinical study. Clin Pharmacol Ther. Epub 2010. Samuelsson S, Bergh S, Ohman PK, Ericsson H. Food does not affect the pharmacokinetics of tesaglitazar (GALIDATM). Diabetes 2003; 52: 567. Fagerberg B, Edwards S, Halmos T, Lopantynski J, Schuster H, Stender S, et al. Tesaglitazar (GALIDA) improves the metabolic abnormalities associated with insulin resistance in a non-diabetic population. Diabetologia 2003; 46: 175. Cha DR, Zhang X, Zhang Y, Wu J, Su D, Han JY,et al. Peroxisome proliferator activated receptor alpha/gamma dual agonist tesaglitazar attenuates diabetic nephropathy in db/db mice. Diabetes 2007; 56(8):2036-45. Ebdrup S, Pettersson I, Rasmussen HB, Deussen HJ, Frost Jensen A, Mortensen SB, et al. Synthesis and biological and structural characterization of the dual acting peroxisome proliferator-activated receptor alpha/gamma agonist ragaglitazar. J Med Chem 2003 ;46: 1306-17. Skrumsager BK, Nielsen KK, Müller M, Pabst G, Drake PG, Edsberg B. Ragaglitazar: The Pharmacokinetics, Pharmaco dynamics, and Tolerability of a Novel Dual PPAR and γ Agonist in Healthy Subjects and Patients with Type 2 Diabetes . J Clin Pharmacol 2003; 43:1244-56. Brand CL, Sturis J, Gotfredsen CF, Fleckner J, Fledelius C, Hansen BF, et al. Dual PPAR α / γ activation provides enhanced improvement of insulin sensitivity and glycemic control in ZDF rats. Am J Physiol Endocrinol Metab 2002; 284: E841-54. Pickavance LC, Brand CL, Wassermann K, Wilding JPH. The dual PPAR α / γ agonist, ragaglitazar, improves insulin sensitivity and metabolic profile equally with pioglitazone in diabetic and dietary obese ZDF rats. Br J Pharmacol 2005; 144: 308–16. Saad MF, Greco S, Osei K, Lewin AJ, Edwards C, Nunez M, et al. Ragaglitazar Improves Glycemic Control and Lipid Profile in Type 2 Diabetic Subjects .A 12-week, double-blind, placebo-controlled doseranging study with an open pioglitazone arm Diabetes Care 2004; 27:1324-9. Homel P, Piaditis G, Koelendorf K, Raz I, Murphy L, Smith P, et al. Antihypertensive effect of Farglitazar, a PPAR r agonist, in patients with type 2 diabetes and hypertension. PPA20006 Study Group; 1 Newcastleupon-Tyne; 6 Glaxo Wellcome, Stockley Park, UK. Abstract: 1052, 87.234.226.93/easd/customfiles/ easd/37th/Abs01/ 1052.html - 5k -accessed on 19-04-2006. Yi P, Hadden CE, Annes WF, Jackson DA, Peterson BC, Gillespie TA, et al. The disposition and metabolism of naveglitazar, a peroxisome proliferator-activated receptor alpha-gamma dual, gamma-dominant agonist in mice, rats, and monkeys. Drug Metab Dispos 2007; 35(1):51-61. Yajima H, Ikeshima E, Shiraki M, Kanaya T, Fujiwara D, Odai H, et al. Isohumulones, Bitter Acids Derived from Hops, Activate Both Peroxisome Proliferator activated Receptor α and γ and Reduce Insulin Resistance. Biol Chem 2004; 279: 33456-62. Oleksiewicz MB, Thorup I, Nielsen HS, et al. Generalized cellular hypertrophy is induced by a dual-acting PPAR agonist in rat urinary bladder urothelium in vivo. Toxicol Pathol. 2005; 33:552-560. Ratner RE, Parikh S, Tou C. Efficacy, safety and tolerability of tesaglitazar when added to the therapeutic regimen of poorly controlled insulin-treated patients with type 2 diabetes. Diab Vasc Dis Res. 2007; 4:214-221. Henry RR, Lincoff AM, Mudaliar S, et al. Effect of the dual peroxisome proliferator-activated receptor-[alpha]/[gamma] agonist aleglitazar on risk of cardiovascular disease in patients with type 2 diabetes (SYNCHRONY): a phase II, randomised, dose-ranging study. Lancet. 2009; 374:126-135. Charbonnel B. PPAR-[alpha] and PPAR-[gamma] agonists for type 2 diabetes. Lancet. 2009; 374:96-98. Marx N, Duez H, Fruchart J-C, Staels B: Peroxisome proliferator-activated receptors and atherogenesis: regulators of gene expression in vascular cells. Circ Res, 2004:94:1168 –1178. Chappuis B, Braun M, Stettler C, et al. Differential effect of pioglitazone (PGZ) and rosiglitazone (RGZ) on postprandial glucose and lipid metabolism in patients with type 2 diabetes mellitus: a prospective, randomized crossover study. Diabetes Metab Res Rev 2007; 23 (5): 392–9. Nissen SE, Wolski K. Effect of rosiglitazone on the risk of myocardial infarction and death from cardiovascular causes. N Engl J Med 2007; 356 (24): 2457–71. Lincoff AM, Wolski K, Nicholls SJ, et al. Pioglitazone and risk of cardiovascular events in patients with type 2 diabetes mellitus: a meta-analysis of randomized trials. JAMA 2007; 298 (10): 1180–8. Juurlink DN, Gomes T, Lipscombe LL, et al. Adverse cardiovascular events during treatment with pioglitazone and rosiglitazone: population based cohort study. 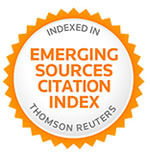 BMJ 2009; 339: 2942. Home PD, Pocock SJ, Beck-Nielsen H, et al. Rosiglitazone evaluated for cardiovascular outcomes in oral agent combination therapy for type 2 diabetes (RECORD): a multicentre, randomised, open-label trial. Lancet 2009; 373 (9681): 2125–35. Rubins HB, Robins SJ, Collins D, et al. Gemfibrozil for the secondary prevention of coronary heart disease in men with low levels of high-density lipoprotein cholesterol. Veterans Affairs High-Density Lipoprotein Cholesterol Intervention Trial Study Group. N Engl J Med 1999; 341 (6): 410–8. Keech A, Simes RJ, Barter P, et al. Effects of long-term fenofibrate therapy on cardiovascular events in 9795 people with type 2 diabetes mellitus (the FIELD study): randomised controlled trial. Lancet 2005; 366 (9500): 1849–61. Saad MF, Greco S, Osei K, et al. Ragaglitazar improves glycemic control and lipid profile in type 2 diabetic subjects: a 12-week, double-blind, placebo-controlled dose-ranging study with an open pioglitazone arm. Diabetes Care 2004; 27 (6): 1324–9. Toma A: Recent advances on Novel Dual-acting Peroxisome Proliferator-Activated Receptor Alpha and Gamma Agonists. 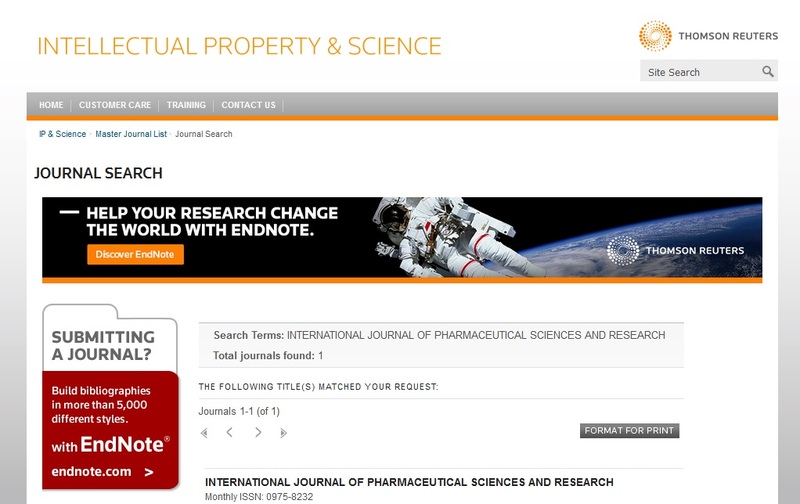 Int J Pharm Sci Res 2013; 4(5); 1644-1653.